So, you're interested in getting a Chrome system. What's available, and which should you choose? Everything I'm going to recommend is on the lower-cost, lower-power end of the spectrum. If it will be used for websurfing and video, these will all fit the bill. 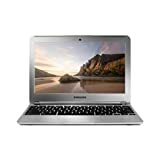 Inexpensive Chromebooks range in screen size from 11.6 inches (Samsung and Acer) to 13.3 inches (Toshiba) and 14 inches (HP). The ones I've listed here all have 2GB of RAM, a 16GB SSD (solid state hard drive) and a Celeron or equivalent processor running at 1.4 GHz. They each have a battery life of 8 to 9 hours. They also have at least 2 USB ports, a full-sized HDMI port to connect them to an HDTV or monitor, a security lock, a memory card reader, Bluetooth 4.0 and dual-band WiFi. They all include webcams and speakers. The Acer C720 is a nice system and is the lowest-priced Chromebook right now. I had the original Acer C710 and now have the C720, which is different only because of a faster processor, a non-glare screen, and the removal of the wired Ethernet, making it only WiFi (like the other Chromebooks). The Acer WiFi is 802.11a/b/g -- no n.
Samsung's entry-level Chromebook costs a bit more than the Acer C720, but has been well reviewed and includes WiFi 802.11a/b/g/n. It's the lightest of the low-end Chromebooks, at 2.4 pounds. Toshiba is a new entrant into the Chromebook line-up, and they upped the game with a 13.3-inch screen! The cost for this is its weight -- at 3.3 pounds, it weighs almost 50% more than the Samsung. But the big screen will make it more usable, especially for older eyes, and if it's not going to be carried around all day, the extra pound might not matter. I'm happy with my Acer but if I were buying again today, I might choose the Toshiba. When you go to Amazon, you'll find other Chromebooks at different prices, usually because of more memory and/or a bigger SSD drive. I personally don't see the 16GB SSD in the basic Chromebook as a limitation. You have Google Drive and Dropbox for storage, and one can always plug in a USB thumb drive. HP offers a Chromebook with a cellular modem and a "free 4G" promotion with T-Mobile. For most people, this is NOT a good deal. The free allowance is 200 MB a month, which the Chromebook will gobble up in the first 3 days (assuming you don't access video or music), and then you're paying -- a lot. Remember, Chromebook is a system that is meant to be online all the time. Samsung is starting to promote their Chromebook 2 which has a faster processor and a bit more memory. People who are into 3D gaming or who want to connect the Chromebook to a 4K HDTV (you don't have one of these) may want it, but for the typical Chromebook user, you don't need to spend the extra money. Now THIS is what WebTV and MSNTV2 should have become. The Chromebox is a Chromebook, minus screen and keyboard, tucked into a 5-inch square box. Just connect it to an HDTV with an HDMI cable, plug in a USB keyboard and mouse or touchpad, Now, lean back in your easy chair, and surf the web on TV like you used to do -- only better! If you'd prefer a desktop computer, the Chromebox works great for that as well -- in fact, the ASUS is currently Amazon's #1 seller in desktops! Connect it to a monitor with HDMI (example in the lst) plug in the keyboard and mouse, and you're ready to go. The Chromebox has both WiFi and a plug for a wired Ethernet connection. In addition to the HDMI connector, it also has a DVI connector for computer monitors. Like the other Chrome systems, the Chromebox can have two displays at the same time. If you're going to connect with HDMI, the cables don't come with the Chromebook or monitors, so don't forget to pick one up. In the call-out box, I've listed the keyboard I recommend. While it says it's for Windows, it works perfectly with Chromebook and Chromebox, with all of the multi-touch features. It uses a single receiver and there's no installation other than plugging it into the US. It's really excellent in the living room, where a mouse isn't a good input device. I have use this keyboard with my Chromebox and Chromebook, so I know it works. The Chromebox has no webcam built in, but most Logitech webcams are reported by Amazon reviewers to work with them. I have not yet tried one myself. The Chromebase is LG's all-in-one desktop that takes the idea of an iMac and uses it for Chrome. Like the Chromebook, the Chromebase is a complete system out of the box, with a 22-inch monitor, keyboard, and mouse. It has both WiFi and a wired Ethernet connector, and has a higher screen resolution (1920x1080) than the Chromebooks and Chromeboxes. It also has 4 USB ports, although two are used by the wired mouse and keyboard that are bundled with it. There really isn't one, beyond the simple instructions about how to connect it to WiFi and sign in. When you sign on for the first time, there is a simple tutorial of 5 or 6 screens that shows you how the touchpad works. If you're already familiar with the Chrome browser and how to search online for answers to your questions, maybe that's enough for you. It isn't for me. Fortunately, Michael Miller's My Google Chromebook fills the need beautifully. It not only walks you through every aspect of the Chromebook (and that works fine also for the Chromebox and Chromebase), it shows you pictures of what you'll see at each step. This is really important: no matter how clearly someone might explain "to close the tab, click the X," if you doesn't know what a tab is or where to look. I have it on my Kindle, which is fine for me. But I recommend the paper copy for anyone who doesn't consider themselves a techie. It's nice to be able to put Post-It notes and highlghts on pages you need a lot. If you are interested in the Chromebox, and setting it up as a desktop machine (as opposed to a TV), don't try to use an old monitor that's pre-HDMI or DVI. While you can buy an adapter for DVI to Analog VGA, you're going to get better results with a new flat-screen monitor with either HDMI or DVI connectors, and they are really reasonable. The monitor showing at right is one example of what you can find. If the monitor connects via DVI, it will come with a cable, but HDMI cables are all bought separately. Get one from Amazon -- don't fall for the overpriced ones in local electronics stores. For more on the Chromebook, come to our Chromebook Club in Net4TV Guides. We've got an entire topic set aside for you to ask questions. This is what I bought when MSNTV2 said we were going to have to go to something else. This really upset me as I really did enjoy it. I'm not crazy about WOW, you can't save articles like this one that I just read, or you can't forward anything. So I went out and bought a laptop, a Toshiba, which cost 1/2 of what the WOW computer cost. I have tried to put items on that so I could use it. It just site on my desk as I'm not savvy enough to get it set up. I also can't spell check with WOW. They have really "dumbed down" the WOW (aka Telikin) computer, and it has not been well reviewed. You might be interested in what Walt Mosberger from the Wall Street Journal had to say in his review , A Simple PC For Seniors Is Complicated By Its Flaws. He talked about how the browser didn't have a Refresh button because, the company said, "it's too complicated for seniors." I'm sure they think that saving and forwarding articles, as you talk about, are also "too complicated." I assume that your Toshiba laptop is Windows? We're going to be doing some step-by-step guides for Windows machines, too, so send me an email or a Talk4TV PM (Private Message) to let me know some of the specific problems or question you have, and we'll try to use those as examples to show how to solve them. I'd suggest a Chromebook -- or actually, a Chromebase, because it's the same all-in-one with a 22-inch screen as the WOW at about 40% of the cost. But you've already spent the money on your Toshiba, so let's see if we can't get it productive for you! Yes indeed, it does. Some of the really good offline apps use Flash. You should be able to do the surveys without problem.